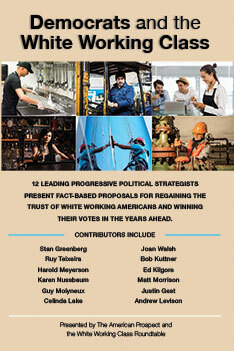 With our partners at The Democratic Strategist, The American Prospect is co-publishing this series of articles on one of the most contentious topics in today’s political discourse, and one of progressives’ and the Democratic Party’s most vexing problems: the white working class. The need for such a discussion is both obvious and two-fold. First, the white working class—the bedrock of the long-vanished New Deal Coalition—has largely and increasingly been abandoning the Democratic Party, even when that has meant voting against some of its economic interests. While Hillary Clinton’s loss of such presumably blue-wall states as Wisconsin, Michigan and Pennsylvania dramatized the extent of the Democrats’ problem, it was also just the latest stage of an epochal shift. Wisconsin, after all, has a wall-to-wall reactionary state government, with Scott Walker having won three elections placing and then keeping him in the governor’s office. Michigan also has a Republican governor and Republican control of both houses of the legislature, while in Pennsylvania, Republicans control the legislative branch as well. Second, every economic and public-health index of how Americans are faring has been turning up alarming news about the white working class during the past several years—a cascade of data showing how their incomes, employment opportunities and labor force participation have been falling, while their rates of drug, alcohol and opioid abuse have been rising, and their very lifespans have been growing shorter. Nonetheless, some in the Democratic camp argue that the party can win without making any special overtures to white workers. The premises behind these arguments, however, are shaky at best. The first premise is that the Rising American Electorate of minorities, women (especially unmarried women), millennials and increasing numbers of professionals (especially those with post-graduate degrees) is sufficient in itself to win elections. [F]or the purposes of political representation one would be hard pressed to name a group—past, present, or future—that is better spread out than the white working class. As a single data point, consider the following: while 43 percent of the age 25-or-older population in the United States is WWC, the median congressional district is just a little over 60 percent WWC…. Only 26 percent of congressional districts have age 25+ populations that are less than half WWC, a striking disparity given the nation’s overall composition. mapping-white-working-class] and as Andrew Levison and the authors of the Working America survey demonstrate in this package of articles, the white working class not only contains its share of progressives, but also, and crucially, a bloc of swing voters that is not ideologically conservative on economic questions and not so estranged from the Democrats on cul-tural issues that they constitute a lost cause when Democratic candidates and progressive canvassers come calling. That bloc, these authors show, is large enough to produce Democratic victories—if and when, and with what policies and candidates, Democrats know how to reach out to them. constituents. Andy Levison argues that Democrats need to entertain a degree of cultural pluralism when mounting candidacies in predominantly white working class districts, while still adhering to the party’s culturally progressive norms nationally. Something of a counterargument to Walsh’s is presented by Jason Gest, who explains how statewide Democratic candidates, including Governor Steve Bullock, keep winning in Montana even though it’s overwhelmingly a white working class state, and one that went heavily for Trump. Like Levison, Bullock writes that candidates who embody their constituency’s cultural values are a sine qua non for electoral victory. He acknowledges that finding a candidate who can do that nationally—finding candidates who can embody the culture of Montana ranchers and, say, theater-industry workers on Manhattan’s Upper West Side—is an impossibility. What a national candidate can do, he concludes, is acknowledge the legitimacy of various cultures, and stress the common economic interests of such diverse groups by battling the financial and corporate elites that have stripped those groups of both income and power. My own prescription for what progressives and Democrats need to do to perform better among white working class voters is geographic, regional, and long-term. It begins with understanding just how profoundly most regions of the country have been left behind by our new high-tech economy. In May of 2016, the Economic Innovation Group released a study—“The New Map of Economic Growth and Recovery”—that made no discernible impact on progressive discourse or Democrats’ strategy during that year’s campaigns. But, like the Angus Deaton-Ann Case studies on rising death rates within the white working class—which did enter progressive discourse but also had no impact on Democrats’ strategy—it sure as hell should have. The EIG’s study strikes me as the necessary corollary to the Deaton-Case documentation of the rise in “deaths of despair.” What it shows, simply, is that businesses and employment opportunities are concentrated as never before in a shrinking number of metropolises, and that the economies of Everyplace Else in America are hollowing out. Consider these stark numbers: In the economic recovery of 1992-1996, the share of new business establishments created in counties with fewer than 100,000 residents was 32 percent; in counties of 100,000 to 500,000 residents, 39 percent; and in counties with more than one million residents 13 percent. In the economic recovery of 2002-2006, the share of new businesses in counties with fewer than 100,000 was 15 percent; in counties of 100,000 to 500,000, 36 percent; and in counties with more than one million, 29 percent. In the 2010-2014 recovery, the share of new business in counties with fewer than 100,000 was zero percent; in counties between 100,000 and 500,000, 23 percent; and in counties with more than one million, 58 percent. In the recovery of 2010-2014, fully half of all new businesses were located in just 20 counties. The geographic trend in net job creation, of course, tracks the trend in business creation. In the recovery of 1992-1996, counties with fewer than 100,000 residents accounted for 27 percent of the net increase in the nation’s jobs. In the recovery of 2010-2014, they accounted for one-third of that—just 9 percent of the new jobs. Conversely, in the 1992-96 recovery, counties with more than one million residents accounted for just 16 percent of the new jobs created, while in the 2010-2014 recovery, they accounted for 41 percent. It should come as no surprise, then, that when Working America surveyed the vote in five key swing states in the 2016 election—Florida, North Carolina, Ohio, Pennsylvania and Wisconsin—it found that the counties in which Hillary Clinton’s share of the vote declined most from that of Barack Obama in 2012 were the states’ rural counties. It also found that the economic metric that most set apart those counties from their urban counterparts in their respective states was labor force participation: the rates were far lower in rural areas than in major cities. If the Clinton campaign didn’t recognize these new metro-rural polarities, the Trump campaign clearly did. His message of job creation was plainly one that resonated in places where work had disappeared, and the rural locations of many of his campaign rallies in the weeks before the election, while bewildering much of the press corps, actually reflected very acute targeting. So Step One for the Democrats in reclaiming a necessary share of the white working class vote is to recognize that their nation suffers from two geographically distinct kinds of economic underdevelopment. One is the kind common to those otherwise prosperous urban areas, where millions of predominantly minority Americans labor in low-wage service and retail jobs. This species of underdevelopment is one with which Democrats are familiar and, indeed, have sought to redress with higher minimum wages, paid sick day and enhanced overtime regulations, and (completely unsuccessfully) labor law reform. But the Democrats have failed even to recognize the second kind of underdevelopment, which is that now plaguing non-metropolitan America, a land of decaying factories, abandoned mill towns and depopulated farms. Or, less apocalyptically, small cities and towns struggling to get by. Raising the minimum wage is good in itself, but doesn’t do much for a town where work opportunities have all but vanished. floated such ideas as regional investment banks to bolster particularly hard-hit parts of the country. Their idea went nowhere, but defense spending in the build-up to World War II rode to the nation’s economic rescue. And straight through the end of the Cold War, the arms economy served as the nation’s public investment/economic development program. Presidents got their Pentagon budgets approved by members of Congress who insisted on defense plants in their districts, while the Reagan Administration in particular made a special point of directing that spending to their electoral base in Sunbelt states. But the Cold War’s end brought with it an end to the military Keyensianism that had propped up much of the nation’s economy, most especially in non-metropolitan areas. The niche conflicts that engage the Pentagon today don’t require that level of manufacturing (nor does today’s semi-robotized manufacturing require as many people as it used to). Step Three in the Democrats’ political revival, then, is to develop and promote a new regional revival strategy—and the “region” is really non-metropolitan America. With manufacturing employing a steadily smaller share of the nation’s work force, that’s not an easy challenge. And the kind of instant mass employment created by the WPA—most of whose workers used picks and shovels—can’t easily be recreated today, either. But that doesn’t mean the Democrats’ hands are tied. For starters, the Democrats should support not simply more infrastructure spending, but specific infrastructure development plans for every state, and an infrastructure bank, or a system of regional infrastructure banks, that could fund them. In the 1970s and ‘80s, Californians were presented with ballot measures that would authorize public bonding to create infrastructure projects; they almost always failed. Once the authors of such proposals wised up and began promoting ballot measures that specified which highways would be built where, and which upgraded, and which districts would get more schools and more parks, the ballot measures began to pass. This is not to say that the national Democrats need to get that specific, of course, but it would be a good idea to develop outlines for plans in each of the 50 states. Those plans could also include, as Vox editor and Prospect alum Matt Yglesias has suggested, relocating agencies of the federal government to different parts of the country, and finding ways to incentivize corporations to move operations outside the nation’s mega-cities. If the Democrats need a 50-state political strategy, they need to pair it up with a 50-state economic strategy. Many of the party’s existing economic plans play well in both spheres of underdevelopment, the urban and the rural, and among groups found in both places, such as millennials. Reducing costs and/or eliminating tuition at public colleges and universities is popular everywhere. The public’s level of support for Medicaid, which Paul Ryan’s proposed ACA repeal sought to slash, is overwhelming: a Quinnipiac Poll from March found just 22 percent favored cuts while 74 percent opposed them; among white working class respondents, 29 percent favored the cuts and 66 percent didn’t. The declining incomes of white workers and the rising eligibility thresholds of the ACA have combined to de-stigmatize Medicaid in ways that Ryan and his ilk failed to anticipate. But just as Democrats speak to preponderantly urban and largely minority service sector workers not just with national programs but also with their support for raising the local minimum wage and kindred measures, they need to speak to preponderantly non-metropolitan and largely white working class voters with policies for non-metropolitan development and job creation. Donald Trump won the White House on vague promises to do that, fool’s gold though they’ll turn out to be. Now, the Democrats need to deliver the real thing. He was a New Yorker and an Easterner. But one of the first tasks which he set himself was the raising up of the South, economic problem number one, still suffering from the destruction of capital in the War Between the States. He was an Easterner and a New Yorker, but the second important task he set himself was to bring to the West the electric power, the rural electrification and the water which it needed to grow. And the West and the South will forever love him—and follow where he led. That love had begun to fade, of course, even before Johnson spoke, but his appreciation of Roosevelt’s trans-regional empathy and economic and political smarts nonetheless rings true today. If they want to win more working-class votes, white and otherwise, and actually build the more equitable economy they seek, the Democrats could use some of that empathy, and lots of those smarts.